Background: This paper is focused on application of a recently developed disposable array of carbon composite electrodes and carbon paste electrode for the determination of indoxyl sulphate. Results: Measurement of basic electrochemical behaviour of indoxyl sulphate on working electrode resulted in the selection of BR buffer pH 2.0 and pH 3.0 as the optimum medium for carbon composite film electrode and carbon paste electrode, respectively. 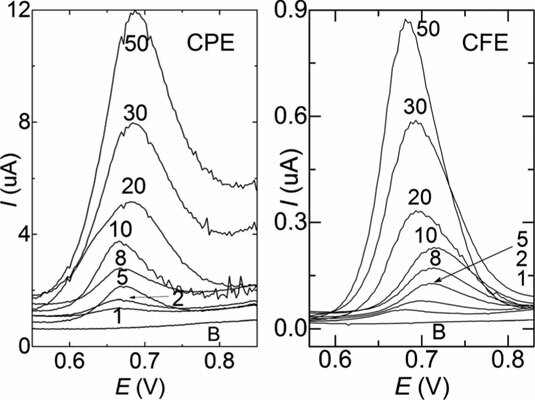 In this medium, concentration dependences of indoxyl sulphate were measured; calculated quantification limits were 0.72 µmol L-1 for the carbon composite film electrode and 1.7 µmol L-1 for the carbon paste electrode. Pasivation of the electrodes during repeated measurements and negligible indoxyl sulphate accumulation was observed. Applicability of the method for the indoxyl sulphate determination in spiked urine samples was tested in combination with the solid phase extraction, where methanol, BR buffer, deionised water and their combination were used as elution reagents. Conclusion: Selected graphite-based working electrodes were successfully applied for the development of suitable voltammetric method for the determination of indoxyl sulphate in BR buffer. Both electrodes showed similar behaviour and sufficient sensitivity and accuracy was reached; however, solid phase extraction was not successful due to ineffectual removal of interferents from human urine. Indoxyl sulphate, carbon composite film electrode, carbon paste electrode, differential pulse voltammetry, solid phase extraction, oxidation.